He completed his basic training on 17 April 2009 and was posted to 1st Battalion The Parachute Regiment. He came to the 2nd Battalion in July 2010, just prior to the battalion’s deployment to Afghanistan. 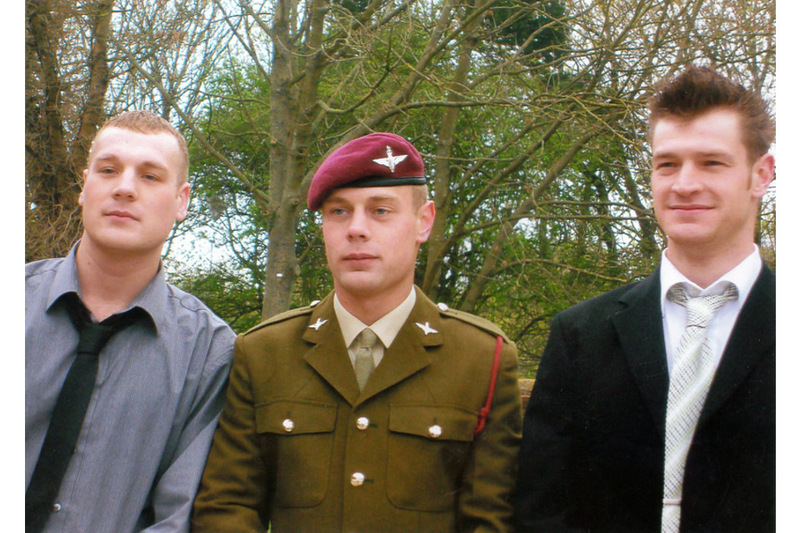 Martin (24) was proud to be in the Parachute Regiment and serving his country. He served three years as a Police Community Support Officer in West Yorkshire Police before joining the Paras. He has made lots of friends easily at each point of his life’s journey. Martin was extremely close to his two brothers, Oliver and Philip. He had a wicked and infectious sense of humour that would have served him well in difficult times. He was due home on his R and R on 14 February. Martin was a well-loved son, grandson, nephew, cousin, uncle and brother. He made us all very proud and he will leave behind a hole in all of our hearts that will never be replaced. He was our best friend too. We are a very close-knit family and, although we are grieving for his loss, we hope that all the other soldiers keep safe. Private Martin Bell died going to the assistance of a critically injured friend in the most dangerous combat circumstances imaginable; ‘greater love has no man than this’. He knew the risks all too well; twice in the minutes before his death he had witnessed at first-hand the devastating human impact of IEDs. The term ‘hero’ is overused in contemporary commentary; take a moment to reflect on the image of Martin Bell, a twenty-four-year-old paratrooper who disobeyed a direct order in order to render life-saving first aid to his colleague. For that exceptional valour he paid the ultimate price. Tomorrow morning the laughter of newly-enrolled Afghan schoolchildren will echo across the impoverished village that Martin Bell died protecting. Perhaps the burgeoning hope of that generation is his greatest legacy; I hope they live their lives with the honour, dignity and resolve that defined Martin. For the Battle Group he has left, we will mourn the loss of a great soldier, a dear friend and an inspirational character. For his family we can offer scant comfort, less our most heartfelt condolences, the assurance that he passed away amongst friends, and the knowledge that he died whilst saving others. Private Martin Bell’s name will be carved into the chronicles of history; he will never be forgotten. Utrinque Paratus. Private Bell died as he went to the assistance of one of his fellow paratroopers who had suffered a serious injury. He disregarded the immediate danger which surrounded him in order to give urgent first aid to his wounded comrade. This selfless act cost him his life. This outstanding act of bravery was typical of Private Bell. He was a mature young man, a true paratrooper of the highest order, who was a genuine top-bloke with a quick-witted and infectious sense of humour. His loss is deeply felt by the men of C (Bruneval) Company and across the whole 2 PARA Battle Group. My thoughts and prayers are with his parents, Simon and Elaine, and his brothers, Oliver and Philip. Private Martin Bell was larger than life; he was a paratrooper through and through. Martin joined the Company just before the tour, having spent the first part of his career in 1 PARA. He was an instant hit and immediately became everyone’s mate. As a soldier he was fit, keen and ruthlessly professional. As a bloke he was amusing, kind and generous. In short, he was an excellent soldier and a thoroughly good man. I enjoyed working with him and fighting by his side; we all did. Private Martin Bell came to C (Bruneval) Company in early July 10 from 1 PARA; Martin fitted in to the Company with ease and was regarded by all as an outstanding individual. He was a mature, motivated, diligent and fit man. He was a Paratrooper; in every way setting his standards above what most could ever reach. Private Bell was respected by his chain of command but more importantly respected by his peers. His infectious humour, quick wit and ability to raise a smile will be sorely missed in C (Bruneval) Company. My sincere condolences go to Elaine and Simon and his brothers, and not to forget his Airborne Brothers. You will leave a massive gap in their lives and ours. RIP. In the short time that I knew Private Bell, he showed himself to be a key member of the Platoon and Multiple. His likable personality and his sense of humour made him hugely popular, not only with the private soldiers but also amongst the commanders. If Private Bell was under your command, a substantial amount of pressure would be removed. He could be trusted to carry out any task with no questions asked, and always to the best of his ability. Private Bell showed massive potential. A team player through and through, he often put himself in harms way for the sake of his friends. A professional soldier to the end, but also a friend who will be greatly missed. Our thoughts are with his family, and his injured colleagues, for whom he gave his life. Private Bell was always Utrinque Paratus, and will not be forgotten. Belly, you’re a mega bloke. It was a massive pleasure being able to work with an excellent professional soldier and a good mate. You will always be remembered for your sense of humour and your amazing scrambled eggs. The world has lost a good man and we have lost an amazing brother. God rest your soul. Rest in peace. AIRBORNE. As a new member of C (Bruneval) Coy he instantly seemed at home with all ranks. He was there as an experienced ‘Tom’ to guide those less senior than him. Constantly smiling, he optimized the infectious optimism that is part of every Paratrooper’s character. From all of 7 Platoon, our thoughts are with Martin’s family and friends. Airborne, we will never forget you. Martin was a real paratrooper - an absolute nightmare while out on the town, but a soldier of the highest calibre. I was proud to have served with him, and even more proud to have been able to call him a mate. Rest in peace my Airborne Brother. I’m lost for words mate. You were such an awesome bloke. Gone but never forgotten. Rest in peace, Airborne. Mate you are a true legend; the most amazing bloke. We have lost one of our airborne brothers, but you’ll never be forgotten. My thoughts are with all your family. Airborne forever. I met Martin for the first time at ITC Catterick, when we started basic training together. Even at depot Martin excelled as a soldier. He passed everything with flying colours and got the award for best shot within the platoon. After depot we got posted to 1 PARA together and soon completed our jumps together. An absolute animal on a night out, Martin loved to have a good time. After one year at the Battalion, we were posted together to 2 PARA shortly before we deployed to Afghanistan. No matter where we went Martin was always a favourite amongst the blokes. I have spent my whole military career with Martin, and it has been an absolute honour. We’ve been through horrible and tough times, but also great times. He could always give you morale no matter where you are. He was a great guy, and would make the best scrambled eggs you ever tasted. But best of all, he was a great paratrooper. All of us are going to miss you my friend and AIRBORNE brother. Private Martin Bell was killed whilst providing security to the local population, and ultimately protecting our national security. It is clear by his actions and from the high praise of his colleagues in 2nd Battalion The Parachute Regiment that he was an immensely brave, selfless and highly professional soldier. My deepest condolences go out to his loved ones and those who served with him.